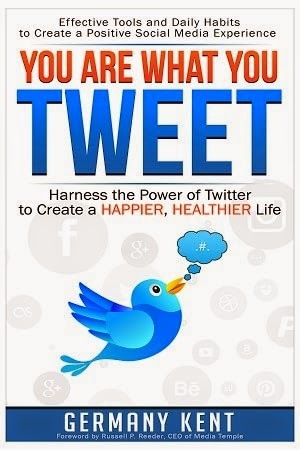 Today we are interviewing author and social media expert Germany Kent about her new book, You Are What You Tweet | Harness the Power of Twitter to Create a Happier, Healthier Life. Germany Kent is a Best-Selling Author, former award-winning university administrator and corporate executive. Currently a personal development coach, and motivational speaker. The native Mississippian has lived in 8 states, traveled extensively and believes everyone has a divine purpose in life and should dream more than others think is practical. You Are What You Tweet is written to offer a source of wisdom and support to people interested in increasing their online authority. You Are What You Tweet will be most appreciated by those looking to expand their social media presence on their journey to self-discovery. Social media expert and author Germany Kent. What inspired you to write a book that helps people become Twitter-savvy? So many people have asked me how to get started on Twitter and how to build an audience, etc. I thought it might be helpful to put together all of the information that I’ve shared and everything that I’ve learned with hopes that it might help many more people discover their Twitter power. When did you first get interested in Twitter? I became interested in Twitter in 2012 and my fascination with Twitter has grown over the years. I see Twitter as a wonderful communication tool that allows you to connect with all types of people all around the world. What are the strengths of Twitter compared to other social media platforms? In my opinion it is easier to connect with people on Twitter who are very relevant to your message. Secondly, Twitter limits your conversation to 140 characters with each Tweet, which allows you to keep Tweets short and sweet and also allows users to stay focused with a target message for each post. What is one of the biggest challenges for people starting out with Twitter? The biggest challenge most people face when starting out on Twitter is a lack of direction. Twitter can be overwhelming at first, but for those who are willing to implement a few tips and tactics, such as those found in You Are What You Tweet, they will soon find Twitter very resourceful and rewarding. How important is it to use hashtags when tweeting? Using hashtags on Twitter is extremely important for your Tweets to be found by others. Utilizing hashtags on Twitter is like the equivalent of the coast guard finding your small boat in the middle of the ocean; they allow your voice to be heard and your messages to be found. How do you think reading You Are What You Tweet will impact people? Those individuals who desire to become social media savvy will benefit greatly from this Tweet Book. The key to being influential on social media is sharing good content and having a real connection with others. Reading and understanding the principles in You Are What You Tweet will equip readers with effective tools and daily habits for a positive social media experience. Next up, I plan to tackle dating with a few tips and tricks. I threw my total self into writing You Are What You Tweet. For 9 months, I have totally focused on the book, blocking out instagram, facebook, cell phone noise, etc. Feels like I’ve carried a baby to full term with this project. I’m so happy that others are getting to experience this labor of love that I’ve poured my heart into.